Origin and Habitat: Tillandsia tenuifolia, is widely distributed, ranging from South Carolina to Florida and the Greater Antilles (Cuba, Dominican Republic, Haiti, Jamaica, Puerto Rico) from Mexico to Salvador as well as Venezuela, Windward Islands, Surinam, French Guyana, Guyana, Paraguay, Argentina, Bolivia, Peru, and northern Brazil. Altitude range: from sea level to an altitude of over 2,700 meters. Habitat and ecology: This species grows as either epiphytically in dry thickets semi-deciduous and evergreen forests or saxicolously, or root on both trees and rocks at a single location, often in huge clumps. In Florida it grows in hammocks and swamps where its tufts cover almost completely the limbs of large, moss-covered trees. In Bahia State (Brazil), T. tenuifolia forms characteristic debris-collecting colonies on the side of granite outcrops. This species often twines around telephone wires, where it thrives and blossoms. Tillandsia pulchra var. patens Wittm. Tillandsia tenuifolia var. surinamensis (Mez) L.B.Sm. 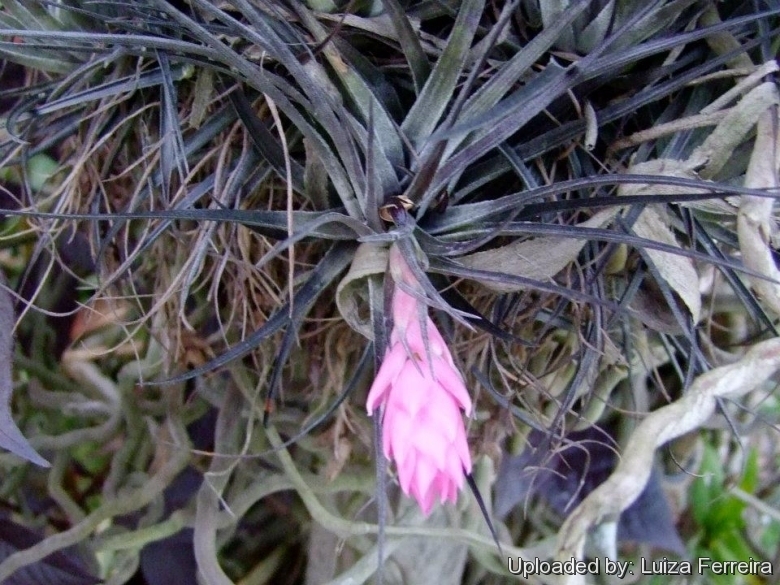 Tillandsia pulchella f. surinamensis (Mez) Luetzelb. Tillandsia tenuifolia var. disticha (L.B.Sm.) L.B.Sm. Tillandsia pulchella var. disticha L.B.Sm. Tillandsia tenuifolia var. saxicola (L.B.Sm.) L.B.Sm. Tillandsia pulchella var. saxicola L.B.Sm. Tillandsia tenuifolia var. vaginata (Wawra) L.B.Sm. Description: Tillandsia tenuifolia, sometimes called the "narrowleaf airplant" is an evergreen, caulescent, perennial, forming small clumps with leaves arranged into thick rosettes. This species is monocarpic (each rosette bearing fruit only one time during its existence). An average adult is normally about 8 cm across and 12-15 cm high (flowering to 30 cm). The relatively short leaves are green, turning to often give the appearance of pine needles. T. tenuifolia is very variable and has at least four described forms. Derivation of specific name: The name given to this small, grass-like tillandsia in 1797 by Linnaeus is the combination of the Latin words, “tenuis” = thin, and “folium” = leaf, hence finely leaved tillandsia. Leaves: 15-30, many-ranked, finely appressed, minutely appressed-lepidote throughout. Blade rigid, very narrowly linear-triangular ribbed, leathery, margins involute, sharp green, greyish green often reddish, 4-15(-30) cm long and 1-4(-7)mm broad. Sheath rust-colored, broadly triangular, flat, not forming pseudobulb, 8-18 mm wide. Roots: T. tenuifolia plants, like other airplants, have little or no roots and absorb most or all of the water and food through their leaves. The eventual roots serve both to attach themselves to rocks or tree hosts and for absorption of water and nutrients and are clad in fine hairs, such roots even pierce the existing leaf sheaths. Inflorescence: Floral scape 8-15(-30) cm long, 2-4 mm in diameter, unbranched, developing in the centre of the rosette, more or less as long as the leaves, surrounded by densely imbricate bracts which, in the lower part are green or rose-coloured with small grey scales, whilst in the terminal part they are pink to red. Sheath of bracts, especially upper ones, narrowing abruptly into blade. Spike erect, palmate (rarely simple), linear, compressed 10-40 mm long, 5-6 mm wide, with oval imbricate bracts 8-12 m long (covering all or most of rachis, rachis not visible at anthesis), thin-leathery, keeled only toward apex, of the same colour as the terminal bracts of the floral scape, each subtending a flower. Branches 1 to 5, apex acute. Flowers: Few (3-15), conspicuous, 20-25 mm long. Sepals with adaxial pair connate, elliptic, keeled, 8-10 mm long, thin-leathery, veined, apex acute, surfaces slightly scaly. Corolla tubular. Petals erect, white, lavender or blue, ligulate, 18-22 mm long.Stamens exserted. Stigma exserted. Blooming season: Spring to autumn. Fruits (capsules): 2-3 cm long. 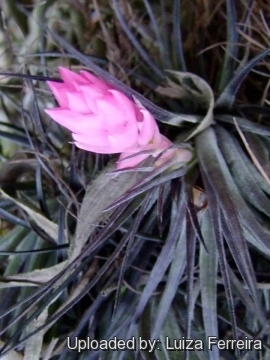 4) PLANTS Profile for Tillandsia tenuifolia “Flora of North America” on [http://www.efloras.org] Web. 4 Mar. 2015. 5) Wikipedia contributors. "Tillandsia tenuifolia." Wikipedia, The Free Encyclopedia. Wikipedia, The Free Encyclopedia, 6 Aug. 2014. Web. 4 Mar. 2015. Cultivation and Propagation: Tillandsia tenuifolia is at once attractive, durable, and inexpensive. This is among the most beautiful of its genus and one that is very easily cultivated. They are green, which indicates a habitat of forest woodlands instead of the more exposed environment of scrubland or desert. For this reason, the plant prefers locations that are brightly lit but not subject to much direct sunlight. Grow it in a well ventilated place mounted on wood or grown bare root. Makes a very attractive hanging cluster in just a few seasons. They can also be grown on slabs of bark or tree fern fibre. Allow medium to dry out between waterings. Exposure: This plant likes bright indirect light or semi-shade and it is best placed in a sheltered spot in the garden during the summer to facilitate flowering.